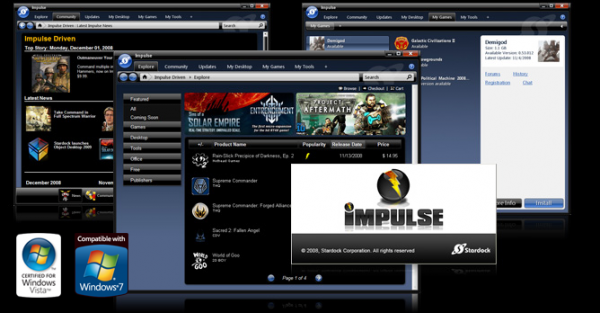 Stardock's Impulse looks to trump Steam's PC gaming portal and digital content delivery system by adding matchmaking into its newest update. The new update will bring like-minded gamers together by detecting each game that you play, constructing a profile based on how you prefer to play games, and suggesting other those other players. In this sense, Stardock -- the development studio responsible for co-op title Sins of a Solar Empire -- is taking data similar to what Co-Optimus' match-up system collects and mashing that up with in-game connectivity options. "You [rank] a bunch of categories, like how competitive you are," explained [Stardock CEO Brad Wardell]. "What matters to you in someone you want to play? Are they a similar age to you? Do they have a good PC? How competitive are they? Are they all about winning, or are they about having fun? Do they value their time? You don't just get to say, 'Yeah, max them all out.' You put them in order of importance." Those self-identified traits are used to match up gamers. If you aren't online when a match with your game is found, you'll see the notification when you log in, and you can send a friend request if you choose. Added the CEO, "The idea is that now you can play with people who are similar to you, rather than some 14-year-old griefer who's shooting you in the back every time because he thinks it's funny." Of course, our first thought was that this would a great resource for co-op players. Don't get me wrong: our PC group has much love for Steam, but when digital distribution systems compete...you win.